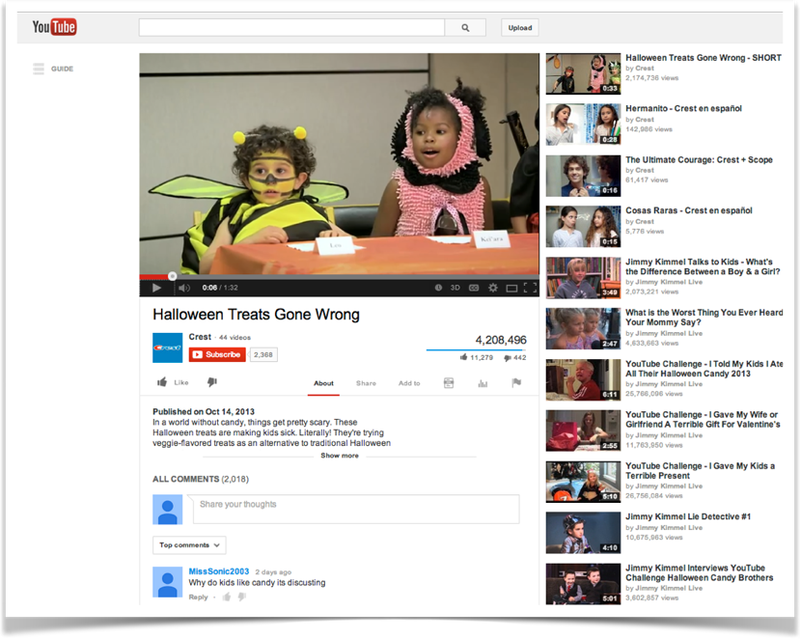 P&G Oral Care tasked us to make BIG videos with millions of views and get a ton of press. Our strategy was to create "Big Bets" out of culturally relevant opportunities with digital only video, backed with paid support. Our first project was for Scope Mouthwash. We decided to extent our social courage campaign with a April Fools Day prank that introduced a fake new product. The video was launched, the press picked it up, and views went through the roof! We next to take it further by including a strong retail component and created a Father’s Day program for for Oral-B power toothbrushes. We created a a video composed of real YouTube content, captured engagement and conversation through #powerofdad, and drove coupon redemption. Again we again had hit with millions of views AND analytics showed that we moved market share of power brush sales at key retailers through coupon redemption. We proved that viral engagement could covert to sales, and were awarded an Effie for the work! The 3rd big bet brief was for Crest. We mined the insight that kids can go have fun on Halloween, and Crest will be there for their oral health when its over. We enjoyed the idea of getting rid of Halloween candy, or replacing it with health food. I did some initial research with my own kids and results were funny enough that we thought we were onto something. The video was launched via YouTube and social, driving to a Crest coupon. Once more we quickly had a viral hit on our hands that captured media attention AND resulted in a spike in sales via coupon redemption.Crest Halloween also won an Effie, as well as a Addy, Webby, and Facebook Garage award.